My Favorite Ultimate Nachos. 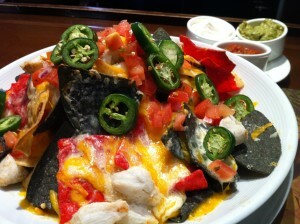 Who doesn’t like a colorful, heaping plate of nachos? 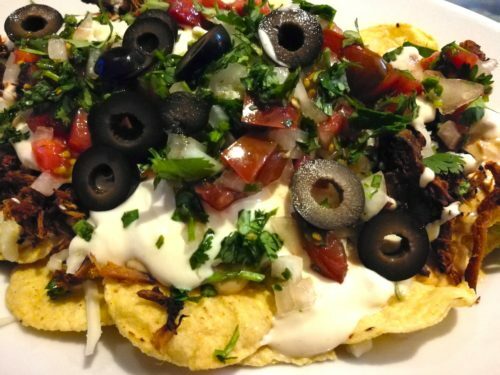 Tortilla chips are draped with chile con queso sauce, sprinkled with black beans or refried beans, shredded pork carnitas and/or beef, shredded cheese, shredded lettuce, salsa, sliced black olives, cilantro, scallions and topped with dollops of sour cream and guacamole. What’s not to love? 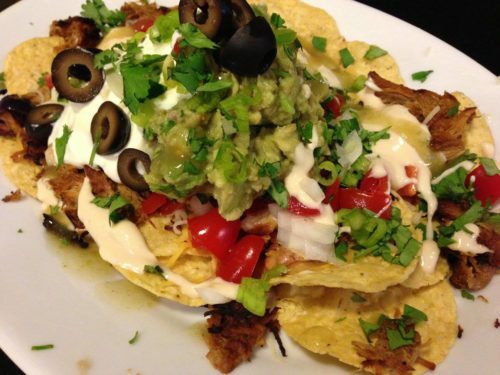 You can serve nachos as an appetizer or a main course. 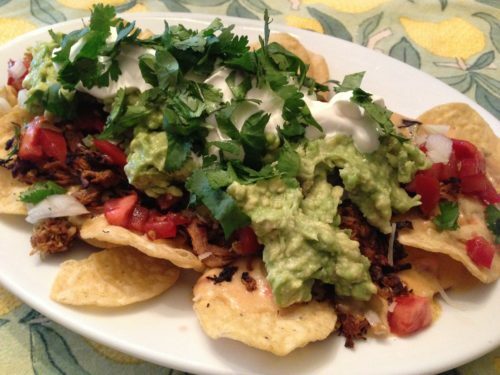 Nachos are a fun party buffet item with a make-your-own-nachos table. 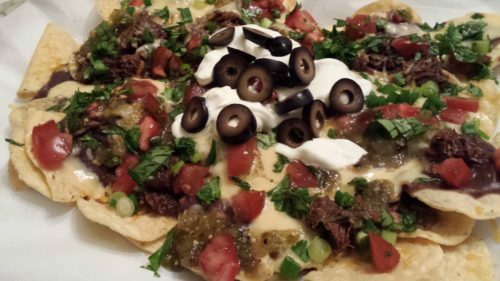 Offer tortilla chips, various meats and cheeses, tomatoes, cilantro, jalapeno peppers, sour cream and Chipotle Cream Dressing, guacamole, and whatever else suits your fancy. A couple of years ago, my husband and I went to the Boar’s Head Inn in Charlottesville, VA for our Christmas holiday. Bistro 1834 at the Inn used to serve a crab nacho appetizer that was out of this world! Seasoned tostadas were smothered with a creamy white con queso sauce and topped with jalapenos, sour cream, guacamole, salsa, and jumbo lump crab meat. 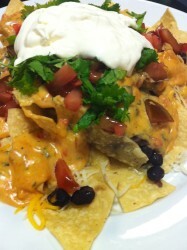 The crab nachos paired nicely with a glass of champagne or single malt scotch. My Favorite Ultimate Nachos recipe uses my own homemade chile con queso dip with smoky chipotles (no Velveeta! ), my favorite guacamole, my party salsa, and my pork carnitas recipes. 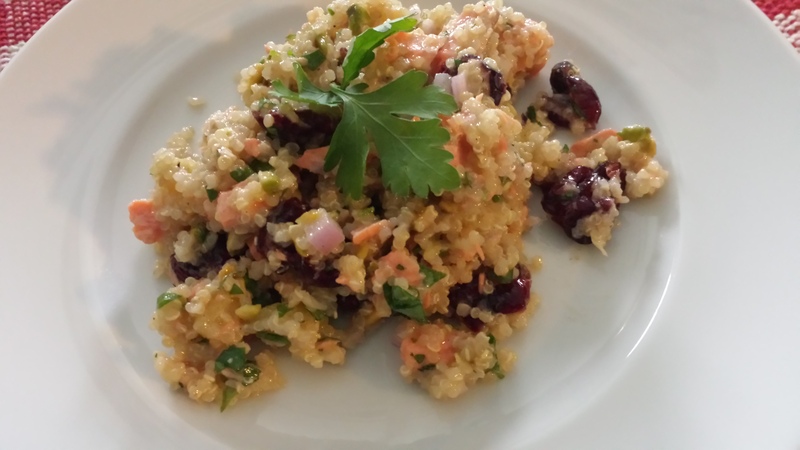 You can use my recipes or make some of your own. It’s a pretty simple recipe if you have the queso dip, pork carnitas, guacamole, and salsa already made. I usually make a big batch of pork carnitas for the freezer. I package the carnitas in one cup servings so I can thaw out a small amount whenever it’s needed. 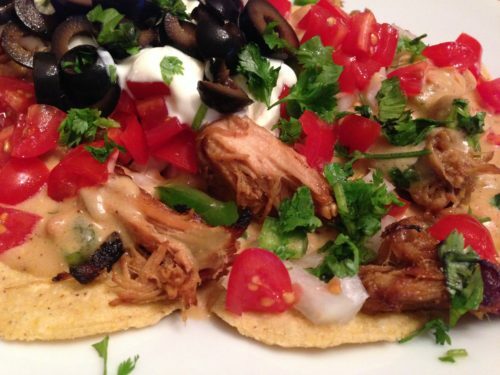 If you serve my Tex-Mex Buffet, you can use those leftovers in this nachos recipe, too. 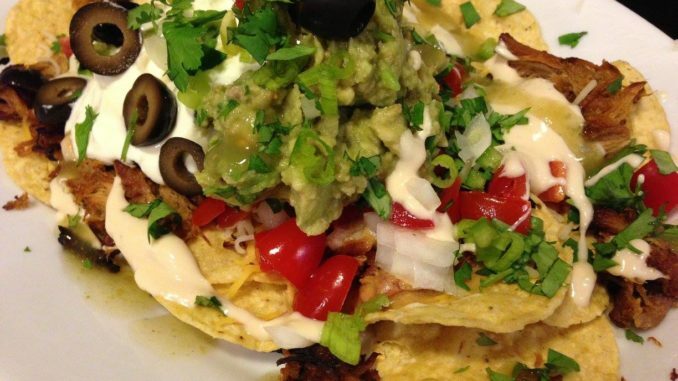 Nachos aren’t likely the healthiest appetizer. However, if you follow my recommendation of eating healthier, and enjoy the less healthy foods periodically, you can still enjoy your favorites. With this recipe, you can load up on the toppings and use fewer chips. Or you can make a big pile of the toppings and then just dig in with tortilla chips. 1. Spread half of the tortilla chips on a large plate or platter. Optionally, you can warm the plate or platter with the chips in an oven at 250 degrees Fahrenheit for 5 minutes. 2. Ladle half of the warmed chile con queso dip over the chips. 3. 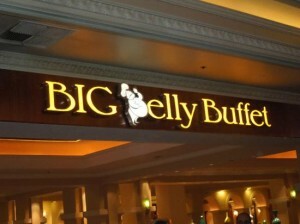 Sprinkle half of the warmed shredded beef, buffalo, pork, chicken and/or ground beef over the chips. 4. Spread the rest of the chips on the meats and top with the remaining chile con queso and the beef/buffalo/pork/chicken. 5. Divide the black beans or refried beans, shredded cheese, and shredded lettuce over the chips. 6. Top with the salsa or pico de gallo and the black olives. 7. 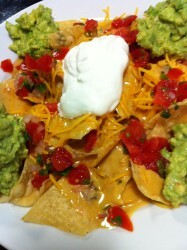 Space dollops of guacamole and sour cream around the nachos. If not using sour cream, drizzle the Mexican crema or Chipotle Cream Dressing. 8. Sprinkle the cilantro and/or scallions over the nachos. 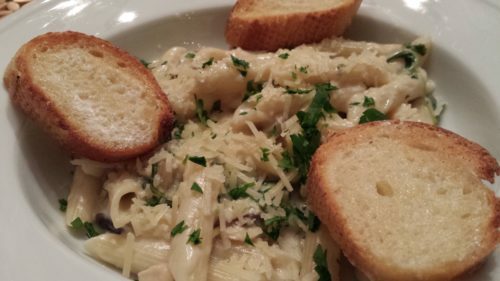 Serves 2 – 4 as an appetizer. Offer as an appetizer course to my Chicken and Spinach Enchiladas with Green Chile Sauce or my Marinated Skirt Steak Fajitas. 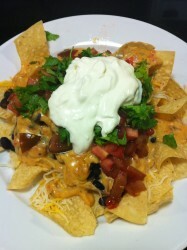 Or you can make a huge platter of My Favorite Ultimate Nachos and serve that as a main course. 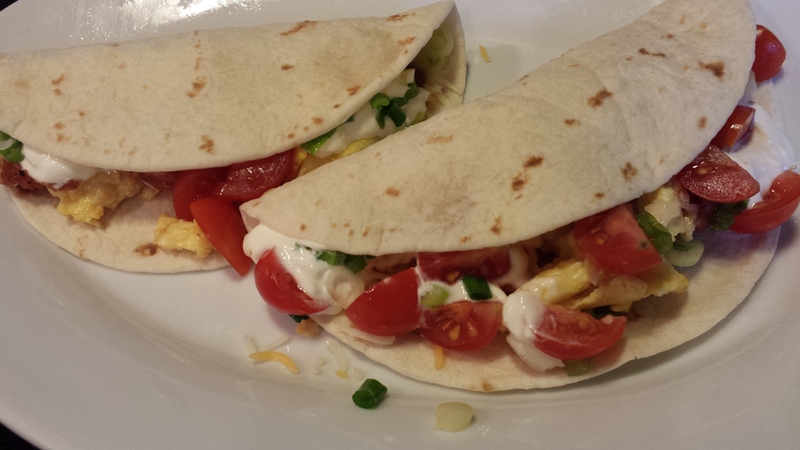 Variations: Use pita chips instead of the tortilla chips. Pile up the toppings like a layered dip and dig in with the chips. Use fancy jumbo lump crab meat instead of the beef or pork for a decadent appetizer. Use a pile of shredded lettuce as a bed for the chips and then add all the toppings. Omit the cilantro if you are not a fan.